New: The Painter Sam Francis (2008), by Jeffrey Perkins. DVD, NTSC, 85 mins. Forty years in the making, ‘The Painter Sam Francis’ is artist Jeffrey Perkins’ lyrical and intimate portrait of a friend, mentor, and leading light of American abstract art. The film retraces Francis’ life and career from his childhood in California to his artistic maturation in post-war Paris, his time spent in Japan, and his return to the United States. Hinging on an interview that Perkins conducted with Francis in 1973, as well as extended scenes of the artist at work in the studio, the film provides deep insight into a man for whom creativity was a powerful life-sustaining force. Interviews with friends, family, and fellow artists - including Ed Ruscha, James Turrell, Bruce Conner, Alfred Leslie, and others (Walter Hopps, Betty Freeman, Ed Moses, and many more) - illuminate a mysterious and complex personality, and its reflection in a body of work that is simultaneously diverse and singular. New: LUMIA: Thomas Wilfred and The Story of Light Art. DVD, NTSC, Region-free. 81 minute Documentary. 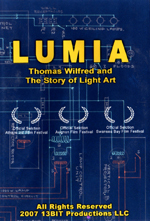 Lumia is the story of Thomas Wilfred and the birth of light art. Wilfred began his career as a Danish Lute player, giving command performances for the Kings and Queens of Europe. He captivated audiences throughout the 1920's and 30's with his sensational projected light shows, named Lumia. World War 2 intervened, followed by television and the New York School of Painting. Wilfred's star fell, and he spent his last decades making automated versions of his work and executing commissions for private collectors and museums. Includes segments on artists Charles Dockum, Chris Sidenius, Mary Hallock Greenewalt, and Earl Reiback. Includes a brief clip from CVM's restoration of a 1952 Dockum Mobilcolor performance film. FEATURING: Craig Antrim, Kerry Brougher, Fred Collopy, Dorothy Conway, Greta Dockum, Eugenia Victoria Ellis, A.J. Epstein, Eugene Epstein, Nancy Frederick, Lawrence Friedman, R.A. Friedman, Hal Glicksman, Robert Haller, Cindy Keefer, Richard Land, Terry Montlick, Otto Piene, Earl Reiback, Jack Shor, Kathleen Sciacca, Christian Sidenius, Steve Smith, George Stadnik, Donna Stein, Karole Vail, Judith Zilczer. Directed by Meredith Finkelstein and Paul Vlachos. 81 mins, 2008 release. Video Out: The Story of VJ'ing and Live Video Art. DVD, NTSC. Via Credit Card - click the order button next to each item; or call CVM with your order via telephone at 213-683-1514 (12-6pm PST). Via Check - For dvds, videos and books, add US$5.00 shipping for first item, .50 for each additional item. CA residents please add 9.75% tax. Via University/Institutional PO - contact us at CVM Store. NOTE: Institutional rates listed do not include public performance rights, only classroom use and non-paying educational use is permitted. Museum exhibitions do NOT fall under these categories; no usage in museum exhibitions is permitted for any of the dvds or videos sold by CVM, please inquire for information on additional permissions and procedures for such requests. Mailing address: Center for Visual Music, 453 South Spring Street, Ste. 834, Los Angeles CA 90013. Prices listed do not include shipping. Please allow up to 2 weeks to fulfill order; most ship within 3 business days. PLEASE NOTE: We cannot accept returns unless product is defective. Please ask questions before purchasing.